So obviously UUURRR is not the easiest mana cost in Vintage, but holy moly, the abilities here are so over-the-top the card demands some consideration. It's hard to imagine losing the game if given even the smallest of windows to start chaining cantrips and rituals. The opponent can try to counter your rituals, but even in the best-case scenario they are giving you two cards for every spell countered. Niv being uncounterable and doubling as both engine and win condition are icing on the cake. Manamorphose would be your best friend in whatever your trying this in. Step Three - Niv-Mezzet + Notion Thief + Timetwister = Profit! I just wanna play this and then Gush to kill a monastery mentor. Notably, this guy essentially counters one half of mentor if they try to stop you from killing it since each spell they cast draws you a card which counteracts prowess (or the monks, I guess). I am guessing this is omniscience's new best friend. Wow I didn't realize you drew cards if YOU were the one playing a spell. So if they Plow this and you Misstep you draw 2 cards. Insane. Time to dust off my city of brass and put them back in a blue deck with Big-Niv in it. This card is absolutely crazy. If he hits the board, I win. Just crazy. 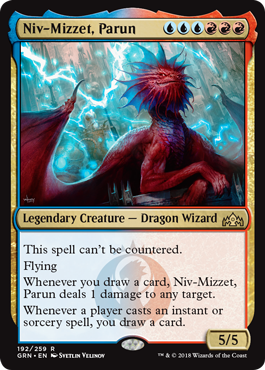 Niv Mizzet, Parun looked insane when he was spoiled, and after playing him in Oath in the Inferno Titan slot, I'm in love. Inferno Titan deals a guaranteed 3 damage when entering the battlefield, but Niv has so many synergies with the rest of the deck that he is almost always much better. Dack, Jace, Sylvan Library, Brainstorm, Ancient Grudge, Repeal, Griselbrand's activated ability---all of these become completely absurd once Niv is in play. Steve in his podcast expressed concern about the difficulty of assembling six colored mana, but I've not found it to be a significant concern. Sometimes you do have off-color moxen you wish were Islands, or 2 blue sources, 1 red sources, and a Black Lotus---but in the late game I'm almost always happier to have an uncounterable creature for UUURRR than a counterable one for 4RR. The other liability is that Niv can be bounced by Karakas, whereas the Titan cannot. The notion to replace Mox Pearl with Strip Mine has crossed my mind from time to time. Here is the list I'm currently testing. @evouga I tried a similar build and it did not go well. I went 2-3 in the league and scraped the deck. Niv-Mizzet, Parun does a lot of work in my Blue Moon deck. If he hits the board it is usually lights out. I am looking into messing around with Sarkhan, Fireblood but it is obviously not a Vintage card and they are pricey because of Standard. Was about to reach out to you on MTGO to apologize for that salt. Was having a lot of health issues and found out I couldn't make it to EW to see my friends because of them. Was incredbily down and getting turn 2 Oath + Fow/ then not hitting a land for Frag/Priest triggered the salt button. So I'm sorry and I apologize. Regarding Niv in Oath, Brian has had some issues with the card, mainly because the draw ability is not optional and there were times where he'd Oath low into Niv and then get decked by Xerox. I think Brian is still going back and forth with his deck for champs as Xerox is really Oath's worst matchup and the Oath into Niv plan has that flaw against Xerox. Castability has not been a concern though. Is a UUURRR spell really harder to hard cast than a 4BBBB spell? Oath still manages to cast Griselbrand a fair amount of the time. I don't know if this has been mentioned in this thread or not, but Gisella doubles Niv-Mizzet, Parun's damage. Sylvan Library is a guaranteed three damage even if you do not pay life to draw additional cards. The Fire side of Fire//Ice will effectively deal three, while the Ice side will deal two and draw two cards. Jace, the Mindsculptor deals three damage from the draws. Niv-Mizzet Parun has been very effective in my Oath decks, but it took some practice. If it is second or third creature to Oath into, or if one other creature is in your hand, I consider refraining from using Oath again because of the potential of getting decked from Niv's draw ability. I still use Inferno Titan in the sideboard because of its utility against planeswalkers, Shops, and Survival. The card's biggest weakness is Pyroblast. However, it is not as weak as could be assumed. It is most vulnerable to the spell when it is hard cast and the Oath player is tapped out. Otherwise the counter battle to follow can cause the game to spiral out of control for the opponent even if they manage to get Niv-Mizzet off the board. I think the biggest downside I have found with the card is its vulnerability to Karakas. All three creatures I play are Legendary, so I really need the Inferno Titan in the sideboard. I basically consider this as my main deck replacement for Inferno Titan at the moment. It is very good against Paradoxical Outcome Decks, and has game against most decks game one. Oath needed some type of upgrade to compete because it has been struggling for quite a while. Oath feels like a tier 1 deck too me again because of this card. @chubbyrain I accept your apology, and struck the comment. I agree that castability is not a big concern, but I'm surprised Brian is having trouble with Xerox---my worst performance tends to be against Paradoxical Outcome (and White Eldrazi, of course, which is fortunately rare these days). I'm running a Memory's Journey, which helps a lot with getting decked (both due to Niv's triggers, and bad luck Oathing) and can surprise some Dredge and Survival pilots. I think the biggest downside I have found with the card is its vulnerability to Karakas. All three creatures I play are Legendary, so I really need the Inferno Titan in the sideboard. I agree. Karakas is supremely annoying. I'll board in Blazing Archon (rather than Inferno Titan, as I like the Archon better vs Dredge and Survival) and Pithing Needle, but I do miss Inferno Titan sidestepping this annoying land completely. As for the performance of the deck, I played it in the Romancing the Stones tournament last weekend and went 3-2 (losing twice to PO, at least one due to poor mulligan decisions on my part). Online my record is 1x 5-0, 3x 4-1, 3x 3-2, 1x 2-3. So I'm not sure I'm ready to claim the deck is Tier 1, but certainly does not deserve a reputation as a terrible/unplayable deck by any means.